Our Compensation Clinic case this week handles a Lufthansa claim for delayed baggage in France that took a several for Lufthansa to even reply to and which they at first didn’t want to pay 100%. The case originated from two friends of mine who aren’t familiar with airline complaints so I promised them to handle their case and put the claim in with Lufthansa and later when the airline didn’t reply the Ombudsman in Germany. Lufthansa managed to lose the bags of both passengers for 3 days total through a connection to Frankfurt on the way to Nice, France which is obviously a destination where you need a bit of leisure and beachwear. The two passengers purchased items valued 726 EUR between each other for the three day trip – the bag reached them on their last evening at 9pm. 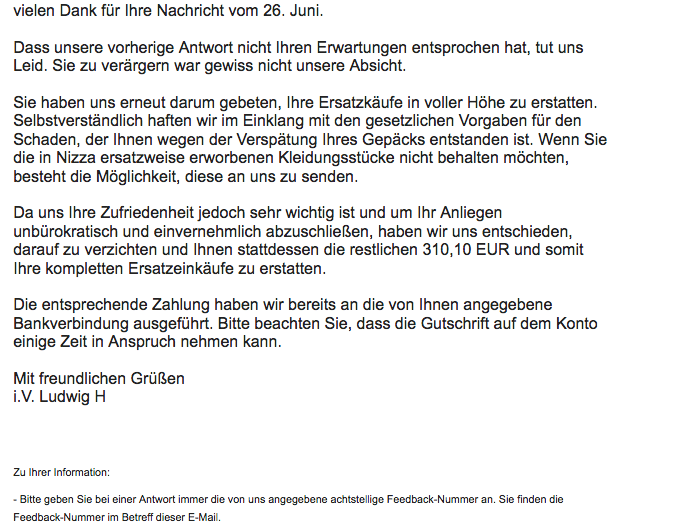 July 25th: LH informed SOP that 2 mth reply limit since my initial complaint haven’t expired yet – BS! Lufthansa’s response time for complaints is absolutely abhorrent at the moment. I’m sure they wouldn’t have replied even after these two full months hadn’t I involved the Ombudsman office. And what was this nonsense about that two months since my complaint haven’t expired yet? The fact alone that the ombudsman office forwards this to me is a joke – these people are supposed to be attorneys so one would think they could read a calendar. I decided to reply to Lufthansa directly, telling them that I won’t accept a partial reimbursement of the relevant expenses, reiterating that the purchases have already been kept to more than reasonable levels and per Montreal Convention the carrier is obliged to a maximum of 1,131 SDR per passenger. 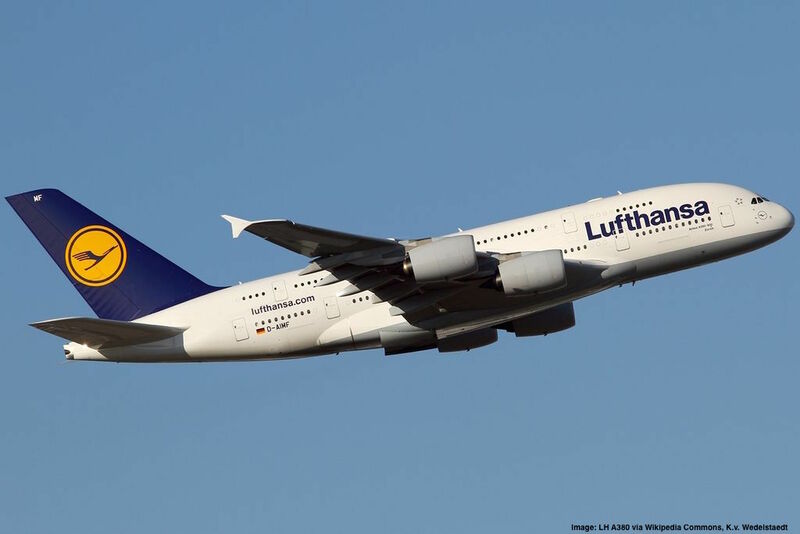 Lufthansa’s internal rules that certain clothing items are not or only in part eligible for reimbursement are not in compliance with the Montreal Convention but in any case they could send a courier to the residence of the customer and pick up the hastily purchased goods. The customer service associate replied that they would reimburse the difference of 310 EUR on top of the previously offered amount. Overall it took over 2.5 months to get this matter resolved and apart from the obvious error in dates within the correspondence it’s a totally pathetic response time for the so called “Premium Carrier” that features a 5-Star Skytrax rating which they don’t fail to pitch at every given opportunity. Never accept anything less than a full reimbursement for lost and delayed baggage related purchases as long as you’re within the limits of the Montreal Convention. Airlines often tell passengers that they aren’t allowed to make certain emergency purchases or at least not exceeding some fantasy sum of $100. This is definitely not true and if you quote the relevant regulation once you put in your claim they will reimburse you, especially if you threaten legal action.